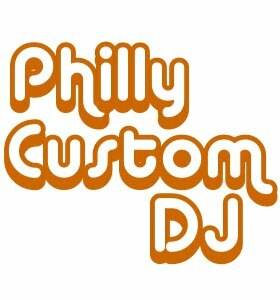 I just finished making a mix in honor if Israel's 61st birthday. You can download it as a zip file here, or as a wma here. You can find them both on the mix page. Here's the picture that inspired the title. Anyone who's seen The Big Lebowski knows Herzl's famous quote about the possibility of a Jewish State, "If you will it, it is no dream." In the picture here, he says, "lo rotzim, lo tzarich..." It translates as "you don't want? you don't need!" It's the kind of thing that an Israeli teacher might say to his class when they are acting up. Kind of like, "if you don't want you recess, you don't need your recess!" 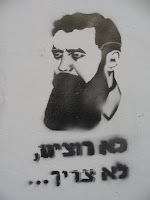 In this case, I think Herzl is saying this to a new generation of Israelis: You want to complain about the state? You don't want a state? Then you don't need one. On the physical CD, I've been trying to graft on a few more pictures. One of them is of Golda Meir (on the right) wearing a party hat, but that's from Israel's 60th birthday last year. She looks thrilled to hell. It almost looks like she's giving me a disapproving look about the mix. Israel Najara (1555-1625) was a kabbalist, rabbi and poet who lived in the land of Israel. Born in Damascus where his father was a rabbi, he moved to Tzfat and then eventually settled in Gaza where he served as a rabbi for the rest of his life. His most well known poem is "Ya Ribon Olam VeAlmaya," which is commonly sung on Shabbat morning. So happy birthday Israel! 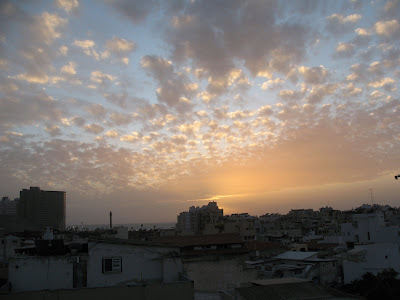 And Tel Aviv, I don't care how old you are, you'll always look young to me. Shine on!